WHEN: runs through March 11, Monday–Sunday, 10 a.m.–9:30 p.m.
For more information on the gallery and the exhibit, visit www.howardcc.edu/galleries. A new exhibit of historical women’s clothing from the era of Baltimore’s famed Cone sisters is on display at Howard Community College’s Rouse Company Foundation Gallery. 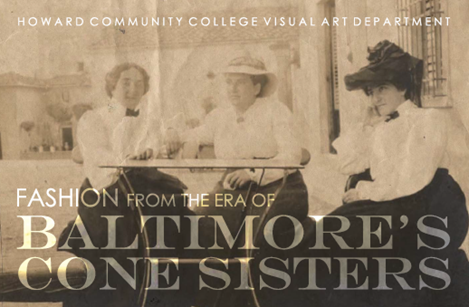 Dr. Claribel and Miss Etta Cone, daughters of German-Jewish immigrants, could have lived unassuming lives in Baltimore at the turn of the century, but instead they traveled the world, amassing one of the world’s greatest Modern art collections. The exhibit was developed in connection with the Rep Stage world premiere of All She Must Possess, a highly theatrical celebration of Etta Cone’s extraordinary life. The exhibit provides an opportunity to view historical garments from the era in which the Cone sisters lived and to learn more about the fashion tastes shared by two of Baltimore’s most famous doyens of Modernity. The exhibit showcases clothing and accessories used for everyday wear, traveling, evenings out, and formal occasions. The exhibit also includes the historical clothing and photographs that inspired Julie Potter, costume designer for All She Must Possess, as she developed the costumes worn by the play’s actors. Accompanying the clothing are Potter’s original renderings of the costumes. In the 1870s, when the Cone family moved to Baltimore, the city had a thriving Jewish community, which included prominent business leaders who founded Baltimore’s most successful and prominent department stores. The prestigious Hutzler’s opened its new, expanded building, known as “the palace,” in 1888. Hochschild, Kohn & Co. gave Hutzler’s a run for the money, opening its own large store in 1897. The two department stores offered the entire Mid-Atlantic region the most current fashions of the day. By contrast, the Cone sisters’ style was simple, conservative, and somewhat austere. They did not adapt to current trends, but instead favored petticoats and long skirts. Their choice in clothing is interesting, juxtaposed with their passion for collecting artifacts and art, which was anything but conservative and plain. As a result, their art collections were modern, exotic, and colorful. Even after the sisters were regular visitors to Paris, they continued to have their clothing custom-made. The exhibit was made possible by the Towson University Historic Clothing Collection, and sponsored by the Towson University Department of Theatre Arts. TICKETS: $40 for general admission, $35 for seniors and the military, and $15 for students with a current ID. Thursdays are $10 performances. For tickets and additional information about the production, visit www.repstage.org or call the box office at 443-518-1500. Since 1970, Howard Community College (HCC) has been a preferred college choice for students and families in Howard County, Maryland. A public community college, HCC offers associate degree and certificate programs, as well as workforce development training and continuing education classes, to nearly 30,000 credit and noncredit students each year. Among HCC’s honors is being named a “Great College to Work For” by the Chronicle of Higher Education for the ninth consecutive year.